MAK will be the most familiar to most people. 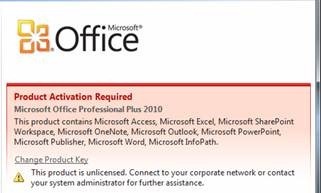 It is simply a license key that you can use to activate Office 2010 on an individual PC. The easiest way to activate an Office install is to wait for the activate nag window to pop-up, select the Change Product Key button, and enter the MAK. The KMS method requires installing KMS on a server on the Windows domain that can service the activation requests. The activation nag screen will pop-up when starting any office application. The red bar across the top stating that activation has failed and you are now in limited mode will show up after activation has failed and the grace period has elapsed. The Office 2010 about page can be seen by going to the File tab > Help. The installer will ask for your KMS License Key for Office 2010 which you can get from your licensing portal. The Office 2010 installer your downloaded from the licensing portal will already contain your KMS client key which it uses when contacting the server. C:\WINDOWS\system32>cscript slmgr.vbs /dlv for more inforamation. The current count item is the one needs to show at least 5. 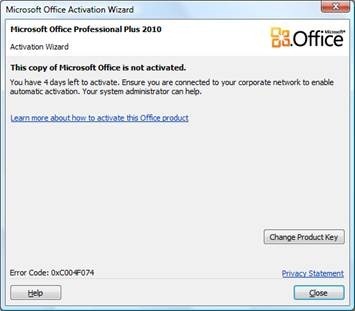 In order to increase the count, you can open unactivated copies of Office 2010 on your computers that will then be added to the KMS pool. These computer need to be part of the windows domain in order for this to work since the KMS server is found through the local domain’s DNS. Nice article about MS Office Activation. Thanks.